I bet you never thought cheese was good for rolling! A Techo known as the Cheese Maker provides a shop with exotic cheeses, which buyers race down the great hills of Meridell. Give it a try, and see how fast your cheese can roll! The goal of Cheeseroller is to roll your cheese down a hill in 60 seconds or less, while hoping to avoid obstacles that can slow you down. You won't actually be able to see your cheese roll, but the game will display your progression each time you roll your cheese. You may play up to three times a day. To begin, type in the name of the cheese you wish to purchase, then click the 'Buy' button. You can check the table below to see a full listing of all the available cheeses and their price; the shop itself doesn't show or list the cheeses. Once you've purchased your cheese, click the 'GO!!!' button. You will then be presented with the main game screen as shown below. Select a movement from the drop down list, then click the 'Go!' button. As your cheese rolls down the hill, the time can pass slowly or quickly, depending on the movement you choose. The game will sometimes give you a random obstacle (which can 8+ seconds to your time). Sometimes, it will instead tell you that the cheese has suddenly moved faster. The distance of the hill will always be 120m for each race, and it will take 12 movements for your cheese to reach the finish line. Each time a movement is made, the distance will decrease 10m until it reaches 0m. If you finish the game and reach the bottom of the hill in 60 seconds or less, you get to keep the cheese you bought at the beginning of the game, and you will receive a Neopoint reward. Here are all the available cheeses you can purchase. You can also click on the item image to view more information in our Item Database. You begin with a jackpot of 3,000 NP. For every second you take, it will decrease by 30 NP. So, at 30 seconds you would have 2,100 NP remaining, at 60 seconds 1,200 NP, and so on. Your score will also be given a rating to reflect how well you did. The table below will show the possible score and ratings. For a few days around August 1, 2018, the starting jackpot was raised to 3,000 NP, with it still decreasing at 30 NP per second to get down the hill. If you have information about the rating for times under 42 seconds, please submit a bug report here! Finishing below 60 seconds or making the high score table requires partial luck. This game is not entirely random, as some might believe. 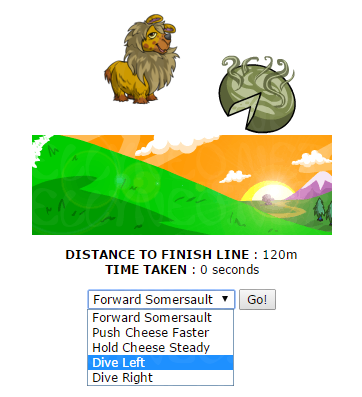 When you use 'Dive Left' or 'Dive Right' consistently, it will help prevent obstacles more often than other movements, leading to a smoother and faster roll. More expensive cheeses also have a greater chance of rolling faster. The avatar is randomly awarded when you finish within 60 seconds. Choosing only 'Dive Left' or 'Dive Right' will give you the greatest chance of getting a score in that range. Use 'Dive Left' or 'Dive Right' consistently to help avoid obstacles. Buying more expensive cheeses helps increase the odds of your cheese rolling faster. This game will not give high Neopoint rewards. Most people play to receive the avatar or trophy. The cheeses you win rarely sell for as much as they cost you to buy.